Hello Friends Today as topic How to purchase Free domain only 99 rupees . We are talking previous post. We have to make beautiful Free website on blogger or customize page , setting of blogger, SEO( Search engine optimization). If you are not reading so before you can read and create make Free website or blogger. And you can earn money online without investment. I suggestion you from godaddy because you can easy way to purchase and place on name server goddy. I think but you can purchase another site as per your choice . 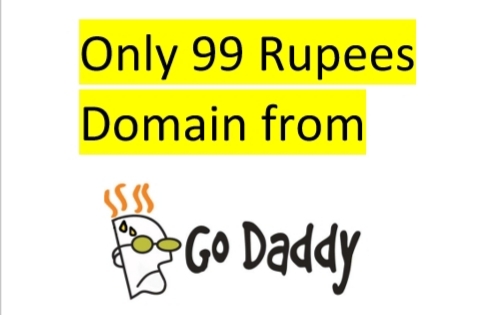 Today as all guide how to buy domain on godaddy website . So Lets us start Friends step by step . Step-1, you go on godaddy or create account. Step-2, Filling all details or then sumbit also verified email I'd. You are see publicing poit in down . Blog adress- You type domain name that is www. (name).com , like as www.Technicalpanditji.com, means Do't forger www. You should me put full name of your domain name . If you face any problems you can comment in box.